The Marriott Hotel Guyana in Georgetown will soon benefit from an eco-friendly, sustainable and cost-efficient energy supply, the mee co Group said in a statement. 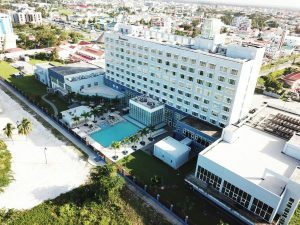 “The leading five-star hotel in Guyana has concluded an agreement on a solar power installation with the global clean energy provider The meeco Group, to reduce its dependence on expensive diesel and shave off its energy costs accordingly,” the company said. After a comprehensive site assessment including the measurement of the real power consumption, Marriott and meeco have decided upon an effective approach: by utilising unexploited free spaces, meeco will construct a mixture of sun2live ground- and sun2roof roof-mounted solar energy systems with a total capacity of up to 900 kWp, which will allow for a total annual energy production of approx. 1,200,000 kWh. meeco’s solar energy system will save approx. 430,000 litres of diesel and will accordingly avoid approx. 900 tons of CO2 emissions every year. The sun2roof and sun2live systems will be equipped with meeco’s tier-one polycrystalline photovoltaic modules entailing a hi gh resistance against salt mist and blowing sand as well as high performances even at low irradiance. The combination with meeco’s intelligent energy management system sun2safe XL including energy storage banks ensures smooth power supply even during cloudy days. This all-in-one shave off solution will be connected with meeco’s real time energy monitoring system sun2see to enable the hotel management concise and customised insights into all relevant performance parameters. The meeco Group was consolidated in 2000 and oriented its main focus towards the energy sector. With world headquarters located in Zug, Switzerland, the group currently has over 86 employees working across four continents. Thanks to a structured but flexible approach based on its core competencies, The meeco Group has delivered over 442 MWp of clean, renewable energy solutions across four continents. The meeco Group accomplishes its mission by providing project developers, investors, governments, and private businesses with the services necessary for timely financing, installation, and operation of clean energy assets.